It's amazing how much chemistry goes on in a garden! "Chemistry" is our word for the way things interact with each other, and change each other. A lot of that goes on in the garden, especially in the soil. Kids love putting garden soil through a pH test. They feel like real scientists . . . and they are! Gardening success all starts with the pH of your soil, and matching it to the needs of the plants you want to grow. Soil pH tells you whether your soil is more acid on one hand, or alkaline on the other. These levels control how available the various plant foods are going to be to the plant roots under the soil. It has to be right, chemically, so that water can dissolve in it. That means, in turn, that the plant's roots can get to it. There's a 14-point pH scale that we use to decide how to rate various types of soils. A reading of "0" means very, very acid, and a reading of "14" means very, very alkaline. You really can't grow plants in extremely acid or extremely alkaline soil. Imagine a bowl of vinegar for the extremely acid environment, or a bowl of salt for the extremely alkaline one. Nutrients just won't dissolve in a harsh environment either way. What we're looking for is a happy medium - a soil pH that is close to the middle. However, because acid is good for the vegetables we like to grow, and often enhances flower color, we're going to shoot for a pH of 6.5 - slightly more acidic soil than 7, the average, which is neutral. A soil test may cost a few dollars in a garden center, but knowing the results will be worth it. You can split your kids up and have each group cover a section of your garden. Dig about four inches down in a few different spots in your garden, and test your soil's pH according to test package directions. Make sure NOT to get test ingredients in your eyes or on your skin. If an accident happens, rinse your eyes or skin with plenty of water. Make sure to wash your hands with soap and water after the test, too. If your soil pH is LESS than 6.5, that means it is acidic. Add ground lime, according to package directions. Never add more than the package calls for. 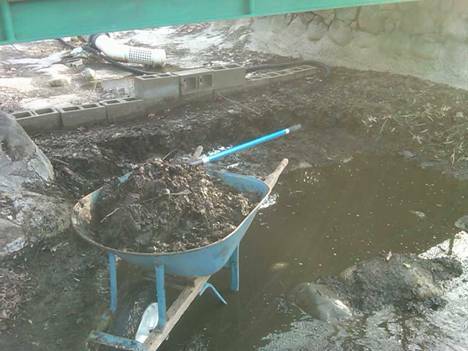 Wear a mask, work on a still day, don't touch the lime, and sprinkle it on the soil with a trowel, then work it in with a garden fork 'til you can't see the white any more. The best time to do this is in the fall, or at least three weeks before planting in spring. 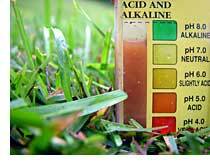 If your soil pH is MORE than 6.5, then it is alkaline soil. The best way to make it more acidic is to add organic matter such as peat moss, pine needles, composted leaves, sawdust, or wood shavings. But it's best to do that in the fall; if it is springtime and you are in a hurry, you can add agricultural sulfur. Follow package directions and work it in with a fork. Note that some plants prefer a little bit different pH than others. You can prepare soil for them a little differently, on a spot basis. Potatoes like a pH of about 5, so if you're going to plant them, you can make that spot in your garden more alkaline than the 6.5 of the rest of it, in order to make your potatoes happy. § Peanuts, parsley and strawberries like a pH of about 5.5. § Carrots, cucumbers, peppers and basil grow best at about 6. § Most other plants will flourish with a pH of 6.5, though tomatoes are happy from 5.5 all the way up to 7.5. How can you find these things out? See the "Plants" section of www.KidsGardenClub.org for pH suggestions on many popular things to grow. Consider getting a good garden book, too. Maybe your club should buy one! Be sure to keep soil test records in your Garden Notebook, including the date, weather conditions and location of the soil samples you took, along with the readings.